Outdoor blinds in the balcony can provide more privacy and prevent rain from going into your house. 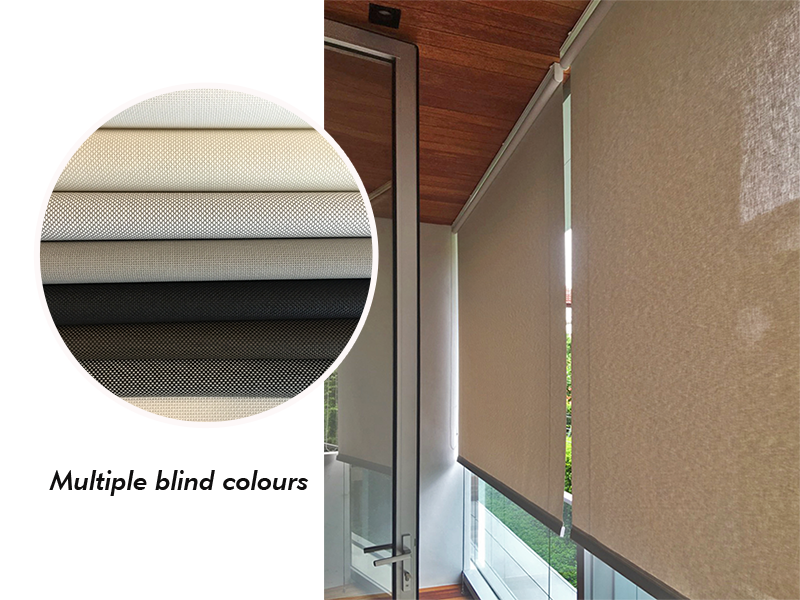 Varieties of outdoor blind colours to match your home design and condominium management approval. Outdoor blinds can be blackout or semi-transparent. 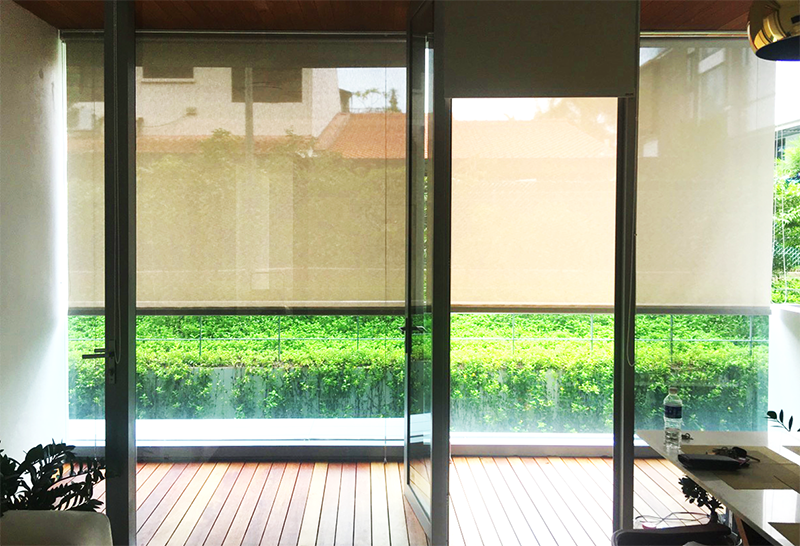 Outdoor blinds are secured by stablising string system to resist the strong wind. Specially made by stainless steel material, stablising string can withstand humid enviroment in Singapore. With so many dealers in the market selling outdoor blinds, you could be puzzled by the vast difference in the price they offer. Here are some important tips on selecting the most value-for-money outdoor blind. The most important factor for outdoor blind is stability. Under constant wind from various directions, the blind system will be pushed and pulled away from its fixing location. majority of this force is being transmitted to the stainless steel stabilizing string at the back of the blind. It is crucial to have sufficient screws firmly fix the string into concrete above and on the ground. In Ming's Living, our stabilizing string system comprises of 8 screws anchored into the concrete. This is two time the amount of screws being used for many other companies. As outdoor blind is also constantly subjected to water and moist, it is necessary for the metal parts used in the system are high grade stainless steel products. Rusting of any component is not only aesthetically disturbing, but also causes irremovable stains on tiles and ceilings and sometimes affects the strength of the screw being anchored. In Ming's Living, we provide stainless steel 304 stabilizing string and screws which ensure 100% rust-free so you do not need to worry about all these. The importance of chain system is always overlooked by customers. A durable and user friendly chain system will greatly enhance the user experience. Majority of the outdoor blinds are large in size, hence the weight against the rolling of chain is heavy. And as the chains are made of plastic, with constant exposure under sun, fatigue may cause the chain to break easily. 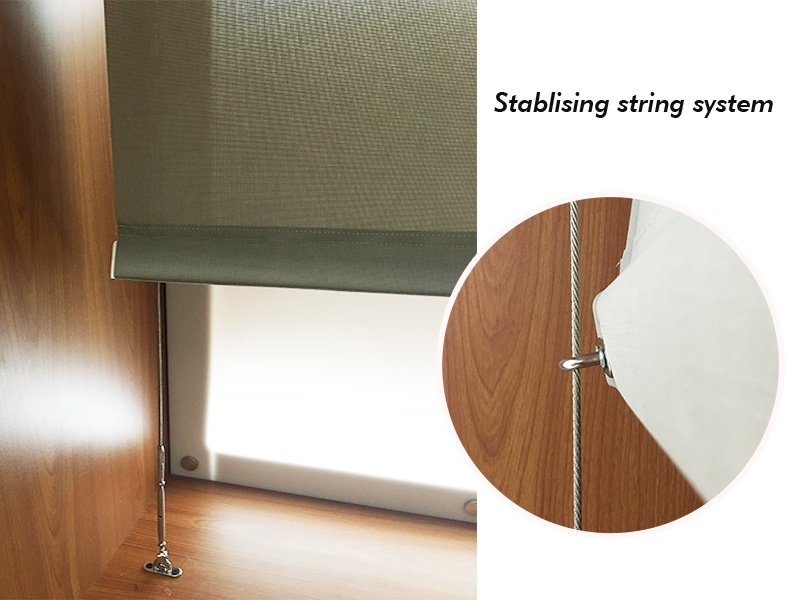 Ming's Living outdoor blind system uses Germany Spring Chain System which fixes the force applied to the chain by user at a comfortable level, no matter how big the outdoor blind is. This eliminates the possibility of excessive pulling force which tears the chain apart. Our beaded-ball chain is also made of strengthen PVC with a extremely high fatigue resistance.